10.) Go to the services.msc and set the same user as you had on your prior CrushFTP 6/7 version, to run the CrushFTP 8 service. Restart the service for the changes to apply. 10.) Go to the services.msc and set the same user as you had on your prior CrushFTP 6/7 version, to run the CrushFTP 9 service. Restart the service for the changes to apply. 11.) Update any paths in the prefs for SSH keys or SSL keystores to point to your new CrushFTP 8 folder. 11.) Update any paths in the prefs for SSH keys or SSL keystores to point to your new CrushFTP 9 folder. 1.) 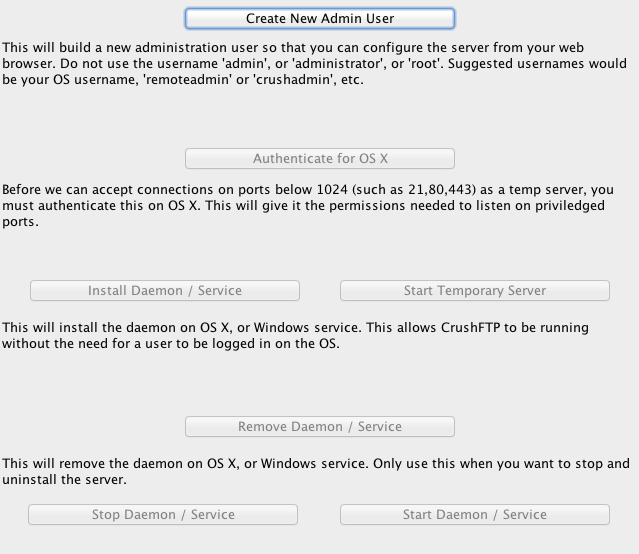 Register your CrushFTP 8 license key within your current version at the admin>>about tab. 1.) Register your CrushFTP 9 license key within your current version at the admin>>about tab.
! *Do not replace your WebInterface folder, the CrushFTP 8 WebInterface folder is very different, and replacing it with the older folder would break CrushFTP 8.
! *Do not replace your WebInterface folder, the CrushFTP 9 WebInterface folder is very different, and replacing it with the older folder would break CrushFTP 9. If you haven't done this then logins may fail when you start using CrushFTP8 as it can't find the users since they aren't associated to the port you are using. If you haven't done this then logins may fail when you start using CrushFTP9 as it can't find the users since they aren't associated to the port you are using.